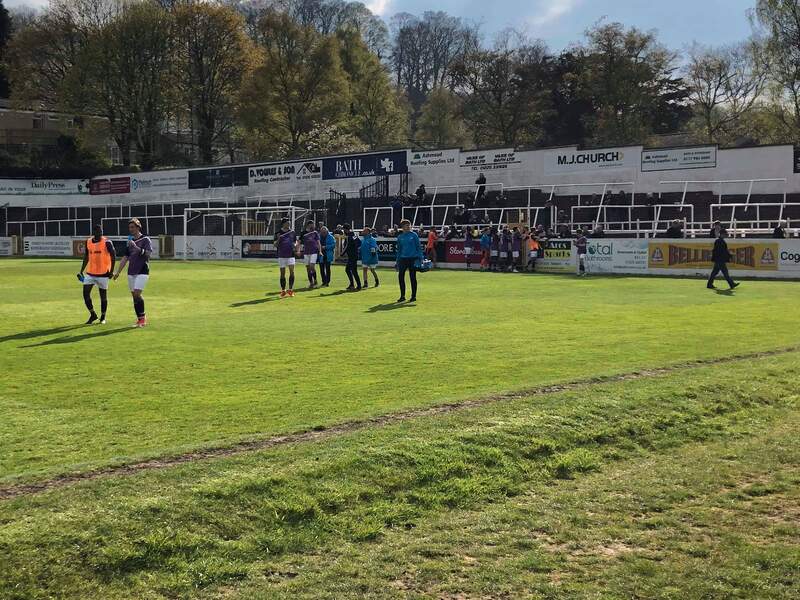 St Albans City moved inside the play-off places with their first ever victory against Bath City at Twerton Park on Saturday. Impressive performances at either end of the pitch set Ian Allinson’s side up for an important three points at a ground that has so often been a tough hunting ground. However, it was the hosts who started the game the better of the two sides and they struck the woodwork inside five minutes after Batten’s vicious effort from range was palmed by Snedker into path of Mann and he saw his first-time effort crash off of the bar. The Saints withstood the home side’s opening spell of pressure and took the lead with their first effort on target after Khale Da Costa’s corner dropped six yards out and Clovis Kamdjo, who managed to lose his marker, directed his header into the roof of the net. Snedker was called upon to make a smart double save just past the half hour mark, turning Rigg’s strike from the edge of the box away to the left before pushing Raynes’ follow-up behind for a corner which a resolute City defence dealt with. The Romans begun the second forty-five in similar fashion and were almost level within three minutes after Cundy met Rigg’s corner, but the midfielder’s header flashed inches over the bar much to the relief of the Saints. Less than a minute later and Snedker was called upon once again, this time palming Morton’s angled effort down before Kamdjo hacked the ball away from danger. The hosts were well on top and it seemed like only a matter of time until they equalised, but that momentum was extinguished with a goal out of the blue in the 54th minute. Michael Clark marched into the home half and found Sam Merson with a diagonal ball that the forward somehow nodded back across goal, onto the opposite post, and over the line. Bath City looked for a way back into the game but were faced with a defence which continued to frustrate them as several aerial bombardments were blocked, hacked and headed away. Ian Allinson was forced into a substitution with twenty minutes left after Scott Shulton went down following a heavy coming together with Morton. The former Hemel man was replaced by Dave Diedhiou and the City manager will be hoping that he will be available for Friday’s game against East Thurrock United. The introductions of Liam Sole and Luke Joyce-Dwarika for Khale Da Costa and Sam Merson added some pace to the Saints attack as the game started to stretch and Joyce-Dwarika played a major role in the third goal. The substitute burst down the right and squared the ball for Sambou who saw his effort blocked in the goal mouth by Batten before it ran into the path of Ben Wyatt and the midfielder’s first-time effort found the bottom corner of the net, completing the scoring on the day that saw the club turn one hundred and eleven years old. The Saints are back on home soil on Good Friday when East Thurrock United are the visitors to Clarence Park, kick-off 3pm.